Coffee tables can sometimes be functional pieces of furniture that look very boring. 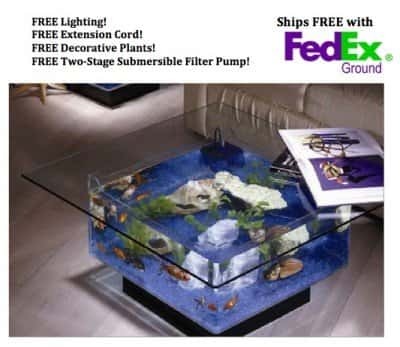 The Tropical Aquarium Coffee Table is certainly not boring. A wonderful decor idea that is capable of bringing light and interest. Even the dullest room will be instantly transformed. It is made from acrylic and beveled and it measures 24"x24" square at the base. The height of the table is 15.5". As you can see in the image the table top is larger than the base, it measures 36"x36". A cool coffee table that you and anyone else who sees it will love. This product is currently on sale for $311 less than the original price so cool! !